Regular exercise can promote health, improve the quality of life and contribute to the overall well-being of a person. A balanced nutritional program when combined properly with an exercise program can maximize the benefits of your workout and therefore the benefits of exercise to your health. According to research, proper dietary choices are necessary before, during and at the end of the exercise since they can boost strength, durability and to help restore muscles. The main goal of the meal before the gym, is to supply the body with the necessary energy for the execution of the exercise program. The lunch before the exercise must reduce the feeling of hunger, but also prevent the possibility of discomfort (‘bloating’) which may affect your exercise performance. To achieve these goals you need to take into account: the size of the meal, when to eat it and what to eat. In particular, before the exercise it is preferable to choose foods that are easily digested and provide direct energy to the muscles. That is why it is recommended to select for your meal foods high in carbohydrates that help maintain blood glucose levels and low protein foods which are more difficult to digest. Foods rich in fat and vegetable fibers should be avoided to reduce the possibility of gastric distress. Eating a large amount of food before the gym can make the digestion difficult and the training more unpleasant. As a general rule chose to consume a larger meal 3-4 hours before workout. If there is no time to have a meal before exercise avoid working out on an empty stomach and choose a lighter meal or snack. The primary objective during the exercise is to replenish the fluids lost through sweating and the replenishment of carbohydrates for energy conservation. The question that arises during the course of the exercise is whether you should choose water or a sports drink for better hydration. The type, the duration, the intensity, the environmental conditions can help us make the right choice. Select sports drink when the exercise is demanding, takes more than an hour and/or is performed in difficult environmental conditions (heat, humidity). What should I eat after the gym? 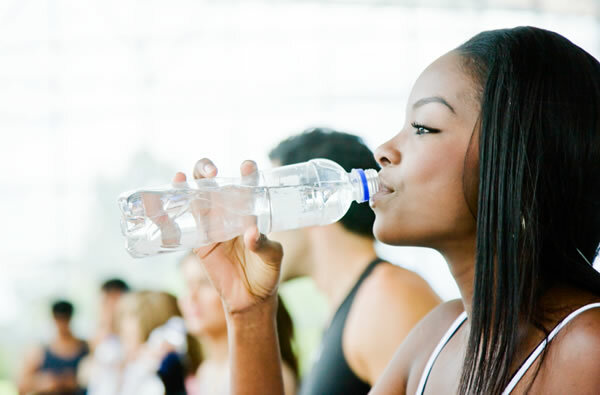 The basic priority after the end of the exercise is to replenish the fluids lost during your workout. In general the best way to determine the quantity of liquids to consume (water or sports drink) is to weigh yourself before and after the exercise and to replace fluid losses. For the replenishment of energy that has been lost during the exercise and to restore muscle tissue that may be damaged due to exercise consume a meal that contains both protein and carbohydrates within 2 hours after the end of the workout. Immediately after the exercise select to consume a sports drink or juice that helps immediately to replenish energy. Meal with meat, starch (e.g. pasta-rice), salad.